On each episode of the NJTV series Pasta & Politics with Nick Acocella, host Nick Acocella invites a New Jersey political giant into the kitchen to talk politics and cook a meal together. On Wednesday, February 13 at 8 p.m, New Jersey Assembly Minority Leader Jon Bramnick discusses his stand-up comedy, and how his legislative role changes, with and without a Governor of one’s own party. Bramnick and Acocella prepare a meal of spaghetti with broccoli and anchovies. Here’s the make-it-yourself takeaway! Cut the broccoli into flowerets. Par boil the broccoli flowerets in water for six minutes, remove from water, and reserve. 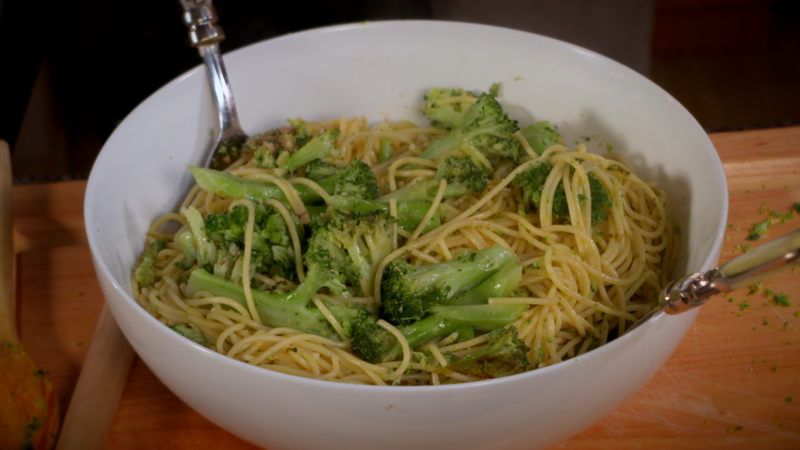 Using the same water in which you par boiled the broccoli, boil the pasta for the suggested time on the box. Coat the skillet with olive oil. Brown the chopped garlic in the oil. Add the anchovy fillets and mash until the fish becomes one with the olive oil and garlic. Sautee until the broccoli is covered in the oil-garlic-anchovy mixture. Add the broccoli mixture to the pasta.